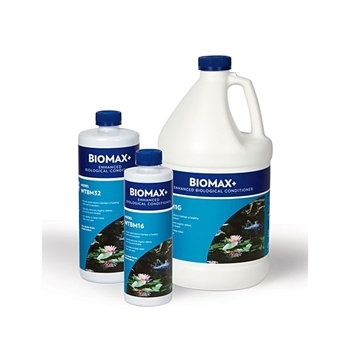 Bio-Max+ enhances bacterial activity with a fast-acting liquid formula that balances the pond ecosystem, removes ammonia, seeds biological filters and reduces suspended organics. A specialized bacterial mix containing billions of microbes work year round to keep ponds healthy and clean. Use weekly to reduce suspended organics and keep pond water clear and healthy.